There are more baby white sharks close to shore than ever before, according to a Southland shark expert. And they’re not leaving any time soon. It’s time for Southern Californians to share the waves with the offspring of the icon of the sea, said shark expert Dr. Chris Lowe, director of the Shark Lab at California State University, Long Beach. 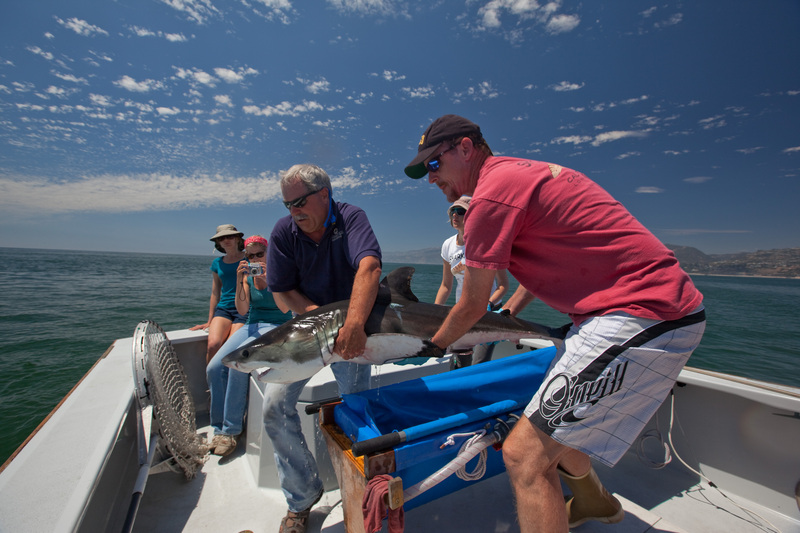 Shark Lab director Chris Lowe helps John O’Sullivan from the Monterey Bay Aquarium release a baby white back to the sea. CSULB students Erica Fox CSULB) and Mary Blasius look on with Angela Hains from Monterey Bay Aquarium.Photo by Kevin Weng. Lowe presented his findings on baby great white sharks last Thursday at an ExplorOcean public lecture in Newport Beach. ExplorOcean is a nonprofit organization dedicated to educating K-12 students (and adults) about the principles of ocean literacy. Getting used to it is key, said Lowe. With the El Nino warm water currents from Mexico, more shark species are on their way, he said, including bull sharks and tiger sharks. Last week, a wounded young harbor seal tried to escape the jaws of a shark, surmised Laguna stand-up-paddler Doug Oyen, an adventure guide for La Vida Laguna. 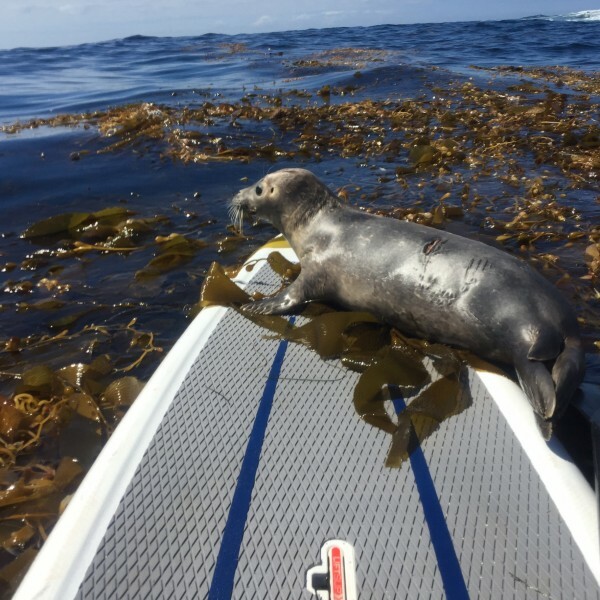 The seal jumped on Oyen’s board off of Seal Rock in North Laguna, he said. The problem isn’t the number of sharks, said Lowe, it’s the number of people. “We have a growing problem on this planet because human population has been growing exponentially,” he said. In 1860, 380,000 people lived in California, according to Calisphere from the University of California. “Now we have about 38 million people, and an enormous 20 million live within 60 miles of the Southern California coastline,” Lowe said. Adult great whites usually veer clear of humans, he said. Typically in winter, when local ocean temperatures dip, great white sharks migrate to warm Baja waters, no matter their age. But things are about to get interesting, Lowe said. Twelve-foot-long sharks tagged two years ago are still here, he said, along with seven-foot-long sharks tagged a year ago and five-foot-long baby white sharks. Adult sharks also prefer offshore rookeries with a cornucopia of fatty seafood. Sea lions are abundant there. Numbering only 2,000 a century ago, there are an estimated 220,000 to 470,000 sea lions in California and Baja today, Lowe said, with Santa Barbara’s Channel Islands home to 20,000. “That could not happen if there’s nothing left in the ocean for them to eat,” he said. For that very reason, top-of-the-line predators in local waters is a good thing, according to Lowe. “What we’re seeing is an entire food web coming our way,” he said. Record numbers of big-game fish are being caught out of Dana Point, local recreational fishing companies report. Federal and state regulations improving air and water quality and fisheries management made California ocean waters some of the most productive for sea life in the world, he said. The Marine Mammal Protection Act of 1972, the California Clean Air Act of 1988, great white protection and gillnet regulations of 1994, and the Marine Life Protection Act of 1999 are just a few that are helping, he said. Lowe pointed to a scattered list of pollution problems projected on an overhead screen: ozone depletion, loss of biodiversity, dead zones, overfishing, run-off, oil spills, trash, bycatch, habitat loss. Americans have “a history of taking too much, and it’s not just fish,” Lowe said, adding that sharks, seals, sea lions and dolphins were hunted nearly to extinction from the early 1900s to the 1970s. Shooting them to eliminate competition was common, he said. on a stand-up paddleboard off of Seal Rock in North Laguna. using the ocean in a greater variety of ways with jet skis, kayaks, stand-up paddle boards and GoPros, staying out of harm’s way is more important than ever, Lowe said.